Container gardens offer endless possibilities for small spaces or as focal points in larger landscapes. 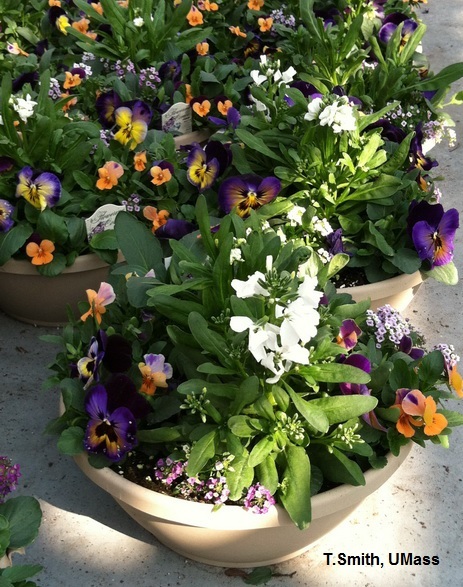 Containers range from traditional pots to buckets with holes, or castoff boots! How much water a container needs will depend on its size and material ‐ is it porous or glazed pottery, metal, wood or plastic? Be sure you have a handy water source. Here are a few easy recipes for annual flower and foliage combinations that use plants listed in Growing Tips 22 + 23, as well as other plants especially useful for containers. These may need twice daily watering, depending on weather conditions. Sweet Potato Vine - 1 plant, purple or "black"
Choose a soilless mix designed for container growing for best results. Avoid using garden soil. Ensure good drainage. Shield holes in the bottom of the container with pebbles or pottery shards to prevent blockage. Moisten the mix lightly before planting. Fill the container – not tightly! – to within several inches of the top rim. Plant transplants 3” – 8“ inches apart. 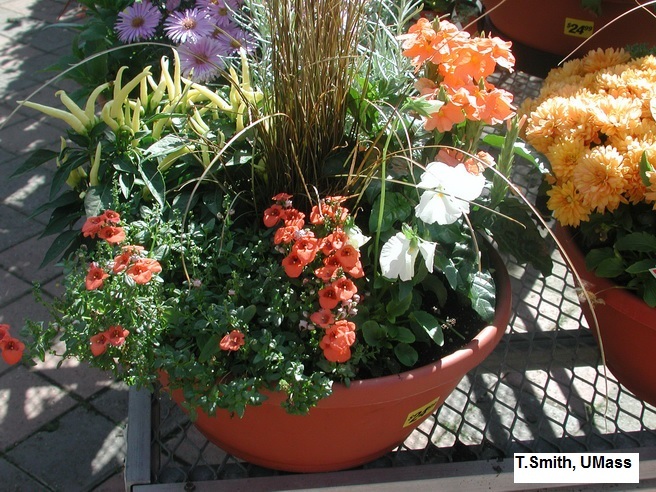 Adjust for container size and mature plant size. Fertilize with a water‐soluble or a slow release product according to directions. Color ideas: Choose complementary colors such as yellows and blues, or monochromatic selections such as shades of pinks or earth tones. Height: Combine trailing and spilling plants with bushy or filler plants. In larger containers, add tall vertical grasses or climbers on supports. Texture: Mix it up with ruffled plants, big leaved, narrow leaved, and stiff, spiky plants. Combine tiny and large flowers with foliage plants. Elevate pots on supports or wheeled platforms to allow for drainage and prevent mold and staining of surfaces. Empty pottery containers before hard frost to prevent cracking.